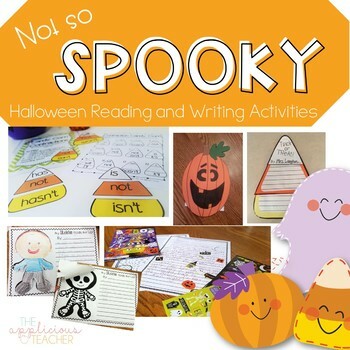 Halloween Reading and Writing Activities! 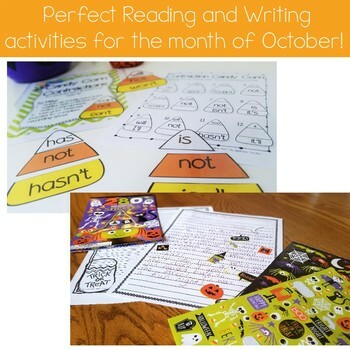 This pack contains 7 fun and engaging activities to help keep your kids focused and on task during the Halloween season! 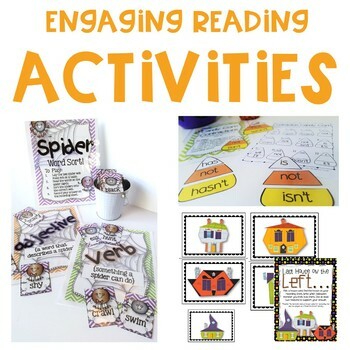 They are a perfect addition to your reading centers, small group time, and to add some fun to your whole group reading and writing time! Last House on the Left- students use the picture cards to infer which Halloween monster lives in the house. Students use evidence to support their answers. Halloween Sticker Stories- Use those fun spooky stickers for a fun interactive writing activity. Students are challenged to write a story and use stickers to replace some of the words, Just like emojis! Includes primary and regular writing lines. Candy Corn Contractions- students match the candy corn puzzle to make a contraction. Includes recording sheet. Spider Word Sort- students sort adjectives and verbs that describe spiders onto the correct web. Includes recording sheet. My Skeleton Holds Me Up- an engaging expository writing activity where students explain why our skeleton is so important. Use as a science connection. Students make a "reveal" craft to go with it! 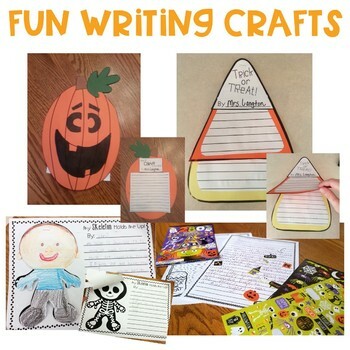 How to Go Trick or Treating- it's always important to practice safe trick or treating, students write to explain how to go trick or treating and publish on a fun candy corn shaped step book. How to Carve a Pumpkin- Carving a pumpkin is fun Halloween tradition! After brainstorming the steps, students write how to carve a pumpkin, then design their own Jack-O-Latern face on a fun craft!